When you need an attorney who will fight hard for you and those you care about, you can turn to Lynn C. Harris. Mr. Harris has fought diligently for clients throughout the greater Salt Lake City region, holding negligent parties accountable and obtaining just compensation for the victims and their loved ones. This is especially important for lawsuits that involve large truck collisions and passenger car accidents. 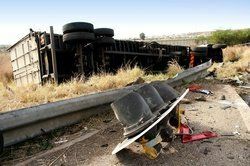 With regard to large trucks, fatigue and exhaustion of the driver tends to be a major cause of tragedies on the road. During the summer, a large Walmart truck got into a collision with a vehicle whose passengers included actor/comedian Tracy Morgan and his friend, writer/comedian James McNair. The accident led to the death of McNair and severe injury to Morgan. The driver of the Walmart truck that caused this accident was apparently driving while fatigued. This drowsiness and lack of alertness very likely led to the accident occurring. Some reports suggest that Morgan may never perform again given the mental trauma, the extent of his injuries, and the physical rehabilitation he needs in the years ahead. Morgan's story may have gotten news coverage lately, but truly, driver fatigue is a danger that's always been present. Many truck drivers are forced to pull long hours on the road in order to make their scheduled deliveries. The companies they work for may push them to the limits of exhaustion, which makes accidents more likely. When a driver is sleepy or not fully alert, he or she experiences poor reaction times, slower reflexes, and impaired mental faculties. The fatigue may be so pronounced that the driver dips in and out of consciousness while on the road. This is unacceptable, and on a busy highway, this can lead to major accidents involving multiple vehicles. Drivers, whether in large trucks or commuter vehicles, need to drive only when they are well rested. It's imperative that drivers stop at rest areas in order to take naps and stretch before they get back on the road. Taking just an extra hour or two to rest can mean the difference between life and death. As for trucking companies, they need to adopt realistic delivery times given the routes involved and make sure that their drivers are given ample opportunities to rest before they start a trip and while they are on the road. If you or a loved one has experienced a serious injury as a result of a truck driver, a personal injury attorney will help you with the litigation process. Compensation will be sought in order to cover medical expenses for your injuries, lost wages, and any other needs in the years ahead. In addition, an attorney will fight to ensure reform on the part of the trucking company so that such incidents do not occur again in the future. Should a love one die due to a large truck accident, an attorney will seek compensation for funeral expenses as well as the mental anguish linked to the death of your spouse or relative. For more information about your legal rights and options following a serious truck accidents, we encourage you to contact a skilled personal injury attorney today. Lynn C. Harris will work closely with you to ensure that you receive sound legal counsel and make the best possible decisions regarding your case.